A basement is a perfect place for a utility and drying room. Out of sight, you can let the washing and general household detritus pile up until you are ready to deal with it. Washing machines and tumble driers can rumble away down below leaving you to enjoy the peace and quiet of your kitchen as a genuine living space. A utility room is a real service area, however, and therefore it has to be accessible in order to be functional. When undertaking initial discussions with builders and architects ensure the style of staircase and its positioning within the house is considered thoroughly. There is no point having your utility and drying area tucked away miles from the kitchen and main living spaces within the house. Staircases have to be wide enough and safely angled to allow you to climb up and down easily, carrying armfuls of washing etc. Drainage is also key and must be explored adequately at the conception stage of your project. 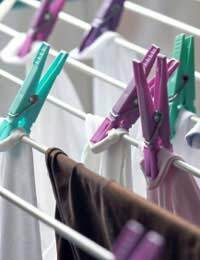 If you plan to use the utility room for washing and drying you will almost certainly require a washing machine and tumble dryer, which will need drainage and ventilation. You may well also wish to have a full-size sink down there with hot and cold running water. Plumbing should not be a problem but ensure you discuss options with an expert. One possibility that might make the process simpler and cheaper could be to locate the utility room below a toilet, bathroom or sink area of a kitchen above. There will also need to be good access to waste water pipes and drains in the area of the basement you plan to convert. The work will need to be done by someone experienced enough to take the necessary steps to ensure drainage is constructed to minimise the risk of flooding from rainwater. If you plan to use the utility room for drying as well you are likely to want to bring the central heating system from the rest of the house down into the space. You will need a decent sized radiator in the room to generate the heat required for drying laundry. This should not be a problem but again advice will need to be taken as to the best location of the utility room taking into consideration the pattern of the system in the rest of the house above. Ventilation is also vital, particularly if you plan to use the new space as a drying room. The basement should already be tanked out and prepared for use as a living space. But steamy wet washing will generate vast amounts of condensation and could lead to damp walls if not dealt with properly. A window is obviously a good idea but in many cases will not be an option in a basement. Even if you have a window, however, you will also need some kind of additional system. These days a wide variety of fans are available. Some are triggered by sensors and will work automatically as you enter the room others can be set by timers which could work well if you know you will be drying for a certain amount of time. You might want to consider the option of running a dehumidifier to help dry washing quickly and prevent build up of damp in the room. Plan the layout of your utility and drying room for maximum functionality. A wall radiator in a towel rail style could work well for drying washing. You may also wish to rig up some kind of indoor washing line or have space for clothes horses – and this will require room. Tumble driers can be stacked on top of washing machines to save space. Remember to leave plenty of room around the sink for ease for ease of use – and generous work surface space may also be helpful when it comes to sorting washing. If space is at a premium then mount cupboards on walls as well as at floor level. This room does not have to be aesthetically pleasing but in order to fulfil its purpose it must be easy to use.